The Colonie editor, Bob Ackerman, and renowned director, Joe Pytka, recently paired up to create a dramatic spot for McDonald’s, out of Burrell Communications. Driven by realistic, gritty, cinematic style footage, the :60 commercial, entitled, ‘Good Things,’ tells the story of a group of African-American teenagers hanging out on dark inner city streets. At first glance it seems that they might have some questionable plans for the evening - However, the story arc soon reveals the group to be a force of optimism, hope and the shared spirit at the heart of their community. Burrell Communications tapped the full range of The Colonie’s editorial, visual FX and finishing services for the commercial, enabling their team to provide the kind of efficient, seamless workflow needed for a quick turnaround. Footage was received on Tuesday, Wednesday and Thursday, and by midday Thursday Ackerman had a cut ready for the agency, and presented it to the client on Friday. Tom Dernulc, the head The Colonie’s VFX department, created a number of visual elements that were integral to strengthening a few of the key points in the narrative. There were no intermediary shots of the final mural as it was being painted, so Dernulc supplemented the footage, ‘filling in’ the art work on a couple of shots, and recreating the skyline, so the mural could be shown in various stages of completion to create a more impactful final reveal. Cut to Marvin Gaye’s iconic song, ‘Inner City Blues,’ the commercial follows the young people through desolate streets, past a wall with graffiti that reads, ‘no future.’ The group meets up and begins hatching a plan. Then, with spray cans in hand, they disperse, leaving the viewer to assume that they’ll be venting frustration and negative feelings with graffiti throughout the neighborhood. The scenario takes an unexpected turn when the teenagers begin to paint uplifting words - like ‘joy,’ ‘hope,’ and ‘dreams,’ transforming building facades and dumpsters into artful canvases with positive messages. 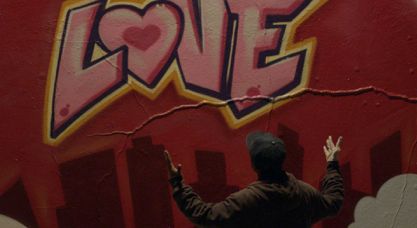 The group of young men put the finishing touches on a large mural of the city skyline with the word “love” above it. As they admire their work a friend arrives with breakfast from McDonald’s – and sharing the meal becomes part of the celebration of their achievement. The commercial closes as daybreak comes, bathing the city in golden light as a father and son happen upon the mural. They smile, appreciating what these young people have created. The boy’s face appears in the center of a heart, and we see the McDonald’s arches in rainbow colors above the tag, ‘I’m Lovin’ It,’ and a link to 365.black, a McDonald’s website hosting the Youth Awards, which was established to recognize black teens who make a difference within their communities through vision, compassion and diligence.